Here I introduce some TOC of the past versions of Apple Human Interface Guidelines, especially looking into the philosophy and principle chapters. The document structure of HIG has been significantly and surprisingly changed through versions. It means that Apple keeps seeking the best way of organizing design documentation. The list of design principles has been also changed several times. Some were added, deleted, and changed orders. By comparing those TOCs, you may find the outlines of the Apple design philosophy with their design principles, design process, concept making, accessibility support, and so on, exposed in each period of time. This may be the oldest version of HIG that we can read today. Actually this document was originally written for Apple II, but the second half of it was covering so-called “desktop interface,” meaning Macintosh GUI. According to Mike Stern, Design Evangelism Manager at Apple, the history of HIG began in 1978. It is obvious that he was talking about this pre-release version because in this document you can see the modification history which tells that the first draft of the document was created by Bruce Tognazzini in 1978. In this very early version of HIG, principles and design philosophy were already featured and described really carefully using many pages. The first chapter – one of the three chapters – is spent for “Philosophy,” and it enlights the art of Macintosh to the people who start designing software user interfaces for the first time. In the appendix, it describes the origin of GUI like that it was invented at PARC, then Lisa and Mac have followed. This is probably the longest and most familiar version of HIG as a standard after System 7 was released until OS X. In the appendix, it introduces a lot of external resources about UI design and cognitive psychology, and it describes terms and concepts, to fulfill a role of textbooks for general UI design and human-computer interaction. The first HIG for Mac OS X (Public Beta). Before this version, Apple had released “Aqua Layout Guidelines” and “Adopting the Aqua Interface” to guide developers for migrating their UIs from classic Mac OS to the new Mac OS X. This version still has that role, introducing Aqua appearance and behaviors, but also it has a full set of philosophy and components descriptions. This version was for the official release of Mac OS X, and it expandend the contents from the previous version. In this period, Apple divided the design document into to HIG and this “Software Design Guidelines,” and the philosophy-related contents were moved to the latter. Even the title uses general words “Software Design,” the all contents were about Mac OS X. In 2005, the contents of this document were merged into HIG again. This was a stable version in the late 00’s. Since this version, the strucure of HIG has been simplified and getting more compact. Design principles were placed under “Design Strategy,” and a term “User-Centered Design” was used instead of “User Experience.” This version was provided by epub format. Since this version published in 2017, As I mentioned, pages about design principles have been removed. This was the first web-native version. It had a lot of animations, videos, and tab-like disclosing blocks within the document. No downloadable documents have been provided after this version. Chapter 2: Content on iPhone: Is It a Webpage or an Application? The first HIG for iOS (well, they were not calling it iOS at that time but). As you know, the first iPhone was not supporting third-party apps, so that this HIG was for developing web contents that were to be browsed with Safari. The design principles were limited and special, and on the whole, it seemed to be composed instantly. The first full-set version of HIG for iPhone that began supporting third-party apps. The design principles were imported from Mac version of HIG. This document was very impressive because it described how to design UIs for mobile devices in quite a lot in detail. Designers were helped so much because they had never designed apps for mobile touch screens. Along iOS 7 released, the HIG for iOS was overhauled. The design principles went under “Design Strategies,” and the User Experience Guideines were deleted. The TOC of this version is almost same as the previous one, but this version was provided by epub format and included some animations to describe things like gestures. This is the latest version at this point. As I mensioned, the design principles were still there but placed in a very small section. This may be the first web-native version. It has a lot of animations, videos, and tab-like disclosing blocks within the document. No downloadable version is provided at this point. Apple had published HIG for their Newton product line. This TOC was a version for Newton OS in 1994. 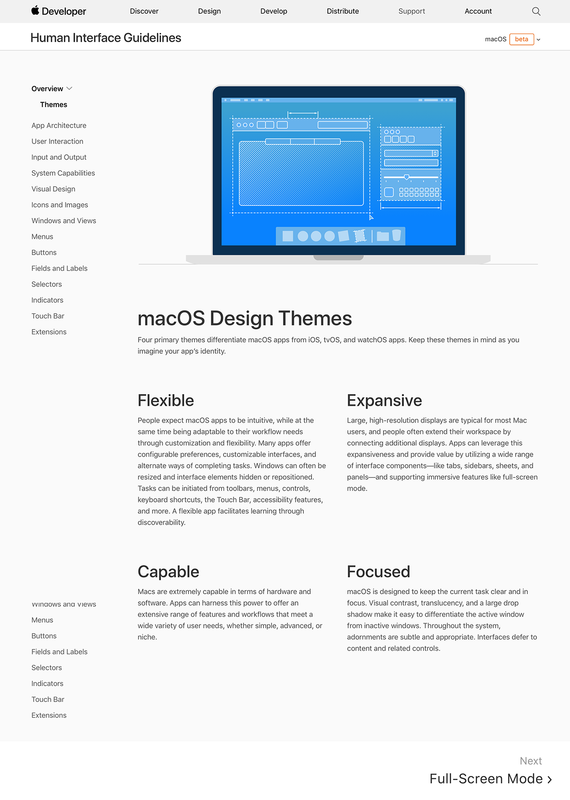 It included the design principles that were taken over form HIG for Mac. I want to note that the title of this HIG uses a term “User Interface” instead of “Human Interface” (so actually this is not a HIG).